IMS designed and supplied six SCR systems to Egypt in late 2016. The emissions target was to reduce NOx emissions lower than 600mg/m3 , SO2 levels to lower than 400mg/m3, CO to below 250mg/min and solid particles to below 100mg/m3 all at 5% dry. 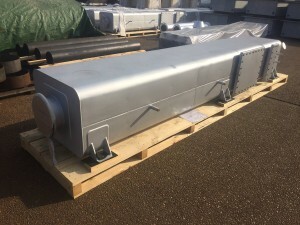 The package included the SCR reactor, exhaust silencer with spark arresting capabilities, urea dosing pump, injector and separate 1,350ltr tanks (client specification), mixers and mixing pipe in Stainless Steel grade, catalytic elements, pressure temperature and NOx sensors complete with a programmable controller.